Animation in adventure games is rarely more than a secondary feature that enhances the visual experience and provides a few cinematic wow moments that punctuate the story. But once in a while are we treated to a game that uses animation as its primary element, brilliantly wielding it to actually tell the story and propel the gameplay; to convey emotions and solve puzzles; to charm and to terrify. 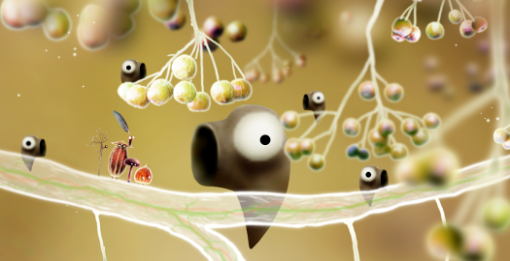 Without a traditional user interface or even dialogues, Botanicula uses the movements of its bizarre world – a surreal tree full of living inhabitants – to weave its tale of courage and commitment in the face of near-insurmountable odds. The experiment-driven gameplay involves animation at its very core: unhindered by instructions, you cavort towards the goal of eradicating the tree of sap-sucking aliens by poking and prodding various characters and items to yield intelligently-devised chain reactions of actions and consequences. Even puzzles use animation expertly in both idea and execution, whether you have to carefully nudge lazily-floating orbs into holes, or participate in a beetle derby. The unique, organic canvas of Amanita Design's latest classic is sketched with elements that are little more than blobs and lines, yet each resident of the vast menagerie of anthropomorphic characters is visually distinct, and enlivened by realistic and captivating animation. The fervent little beings exist in a constant state of motion, whether talking, laughing, fighting, eating, sleeping, or colliding. Besides the main quest, there are distractions aplenty: you can click flowers into blooming, disturb creepy-crawlies ensconced in nooks and crannies, play chase with baby-bugs and watch gory puppet shows. Physical gestures are excellently adapted in movement and expression, and despite the overall cutesy ambience, fear is visceral as you watch invading spidery parasites relentlessly drain the tree of its sap. Playing Botanicula is like being there, and for illustrating that you can engage, challenge and entertain without saying a word if you have the right moves, it flutters off with this year's Best Animation award. 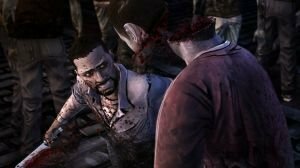 I think we can safely declare the The Walking Dead not only the readers' choice for Best Animation, but the unanimous winner of the "Best Reanimation" award as well. From convincing human interaction to terrifying zombie attacks to shambling, shambling everywhere(! ), this is far and away the most cinematic Telltale adventure to date. The five-episode season often felt more like an interactive movie than traditional adventure game, thanks in no small part to the rich animation that brought the zombified world to... life (so to speak). Next up: Best Music... the envelope, please!